Mass Appeal‘s Rhythm Roulette series rolls on once more, this time with 6th Sense and Tanya Morgan randomly picking three records whilst blindfolded. 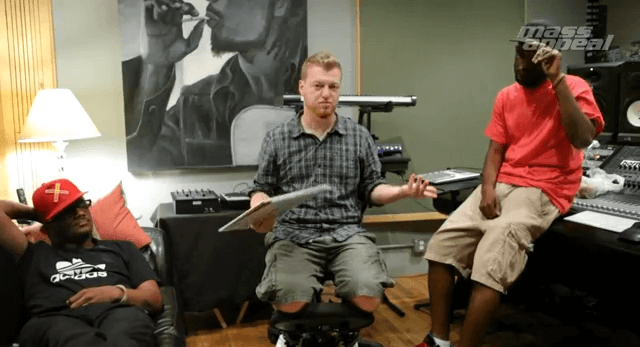 This is arguably the best episode of Mass Appeal’s Rhythm Roulette not least because the end result is dope and it includes rappers rhyming over it. For anyone who isn’t up on this, Rhythm Roulette is a video series where producers pick three records to sample whilst blindfolded. Fresh off the back of their brand new album “Rubber Souls“, Tanya Morgan and 6th Sense were the latest participants in the series and 6th managed to pick some real heat including Billy Ocean’s “best album ever”. The finished product sounds album-ready from the snippets you hear and rhymes from Von Pea and Don Will are really fresh.